PARTNERING WITH LIBRARIES FOR TRANSFORMATIVE CHANGE. Learn more about recent projects and be inspired to start your library on a path to higher performance. State library association designs future goals and strategic direction based on member interests and needs. 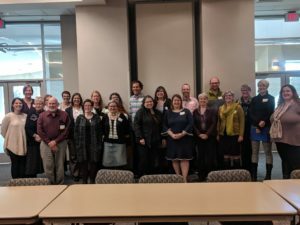 Minnesota Library Association provides advocacy, education, engagement, and leadership for a membership of over 600 multi-type libraries across the state. They underwent a comprehensive planning process to provide the organization with strategic direction through 2021. 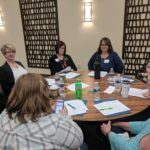 Concerned with increasing engagement and education for their membership, the MLA planning team sought input directly from members as part of their planning and relied on evaluative feedback from surveys, focus groups, interviews, and a member summit. The team consulted plans from other state library associations and sought board and management input, as well. An environmental scan revealed areas of concern for libraries including funding, information security and data privacy, social perceptions of libraries, diversity and equity considerations, net neutrality, and more. A SWOT analysis performed during the summit served to outline current issues specific to MLA and their members. The team was able to craft new vision and mission statements as guided by summit participants, and goals and activities were defined for each new strategic direction. MLA adopted their plan in December of 2018. With a community focus, library considers strengths and needs to shape future goals. Highland Park Public Library serves a population of 30,000 and is located in the northern suburbs of Chicago. They adopted a three-year strategic plan to take them through 2021. Highland Park’s process began with a review of existing data, a community survey, and focus groups conducted with community members. The survey and focus groups revealed several current strengths and a few areas ripe for improvement. With these factors in mind, future needs were considered and outlined as a means to guide further discussion with the board and staff. The planning team narrowed down new vision and mission statements and honed the strategic directions for the plan. A staff retreat helped shape the final plan, and goals, potential activities, and measures of success were outlined for each strategic direction. Overall focus areas for learning and enrichment, optimizing resources and collections, and strong organizational capacity will guide staff in their activity plan and continued evaluation through 2021. 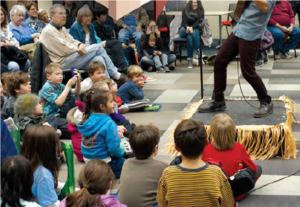 Library launches strategic plan that builds on community engagement. Palatine Public Library District is located in the northwestern suburbs of Chicago and serves a population of 89,000. The Library had financial and long-range plans in place but sought to unite and inspire their plans with community and staff input. Library Board and staff members met to review existing data and learn about community needs. Through consultation of a community survey, interviews, library statistics, and plans from other community organizations the board and staff began to outline Library strengths and challenges. Focus groups were formed to increase understanding of community concerns. Board and staff retreats helped to narrow the Library’s vision, mission, and new strategic focus areas of experience, engagement, and endurance. Palatine Public Library District was then able to to move forward with a cohesive new strategic plan allowing staff to draft an activity plan for implementation. New strategic plan guides ILS in three focus areas: training, technology, and organizational development. Lakeland Library Cooperative Integrated Library System (ILS) in western Michigan provides resource sharing tools for their 40 public library members. Their goals of cooperation, resource sharing, and service to users for libraries of all sizes make up the backbone of their new strategic plan. Data from a member survey allowed for valuable input and helped LLC ILS narrow the focus of their new plan to three specific categories: training, technology, and organizational development. Focus groups, interviews, and a Member Summit provided forums for further discussion and brainstorming as the strategic plan began to take shape. Staff worked to refine new vision and mission statements as well as definitions for each focus area. The new strategic plan outlines goals, activities, and measures of success for each of the three focus areas. Following adoption, LLC ILS implemented an Activity Plan that builds on the focus areas and helps guide staff through evolution of the goals and activities. Their SWOT Analysis is a further example of their work towards specific goals setup by the new strategic plan. Specific metrics for continued evaluation will be gathered and progress reported to LLC ILS members. Future services and programs informed by library’s community survey. Broadview Public Library District, located 12 miles west of Chicago, engaged in a community survey to learn more about patron satisfaction and future needs. The survey helped establish baseline data regarding respondent knowledge of specific library services and programs to help the library develop outreach messaging to attract new users. Through the survey, the library learned the top reasons why people use the library along with barriers for increased usage. Broadview PLD specifically used the survey to spread the message about the value of a library card, so some questions compared free or low-cost library services to similar services available in the community for a higher fee. In addition, respondents offered comments about why a library card is a good value. Future focused questions delved into why respondents like living in the community, how to improve quality of life, and what’s not being offered in the community that could possibly be offered at the library. These responses will help the library plan activities for the near future and be the foundation of a strategic planning process. New strategic plan focuses library’s goals in culture, connection, and creativity. Even in the parking lot, you can tell that the Indian Trails Public Library District (ITPLD) is a special place. Having recently completed a building renovation and expansion, the library was ready to take on strategic planning in 2017. Located in Wheeling, IL, the library’s district covers not only Wheeling, but parts of Prospect Heights (including a storefront branch there) and Buffalo Grove northwest of Chicago. During the planning process, the library completed a community survey and received a 90% satisfaction rating from respondents. Meetings with the board and staff, along with a series of public focus groups, affirmed three focus areas: Culture, Connector, and Creativity. “The feedback from the management team who have done the whole strategic planning process in the past is that this process was probably the best and had the clearest outcomes for how it will be used going forward,” said Brian Shepard, Executive Director of ITPLD. The planning process resulted in a one-page plan graphic that is a high-level snapshot of the library’s Vision, Mission, and Focus Areas. In addition, the detailed plan includes the goals for each Focus Area. Both plan documents are visually appealing and will be instrumental in communication about the library’s strategic direction. Strategic planning process brings consortium members together for growth and impact. One hundred twenty-seven libraries in Reaching Across Illinois Library System (RAILS) share an integrated library automation (ILS) system known as PrairieCat. The consortium includes public, school, academic, and special libraries of all sizes in northern Illinois. In 2017, PrairieCat members initiated a strategic planning process to inspire their next phase of cooperative services. The planning process included Zone Meetings across PrairieCat’s large geographic area to gather member thoughts about opportunities and barriers. Next, a member survey asked for more specific feedback about four key areas. Finally, members came together at a Summit to brainstorm activities that would help achieve internal and external goals. The resulting plan will guide PrairieCat for the next several years as they explore new ways to engage members, improve training, evolve their governance, and enhance user experience. Contact us now to learn more about how we can work together to move your library forward.